Make Valentine's Day extra sweet with our Valentine's RICE KRISPIES® TREATS™. 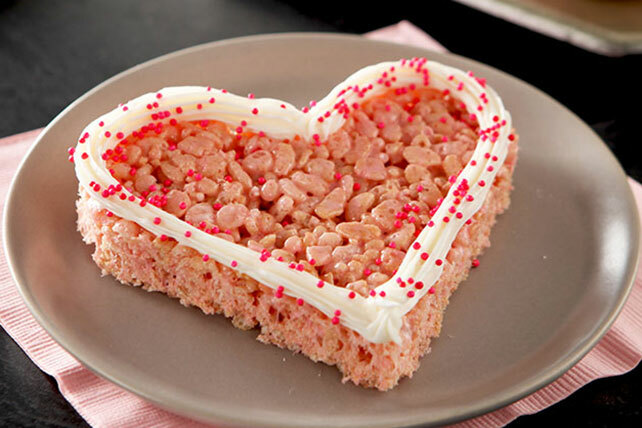 Our Valentine's RICE KRISPIES TREATS®are pink hearts topped with icing. Melt butter in large saucepan on low heat. Add marshmallows; cook until marshmallows are completely melted and mixture is well blended, stirring constantly. Remove from heat. Add food coloring; mix well. Add cereal; mix well. Press onto bottom of 15x10x1-inch pan sprayed with cooking spray. Cool completely. Cut into heart shapes with greased 4-inch cookie cutter. Decorate with icings as desired. Place butter in large microwaveable bowl. Microwave on HIGH 45 sec. or until melted. Add marshmallows; toss to coat. Microwave 1-1/2 min. or until marshmallows are completely melted and mixture is well blended, stirring after 45 sec. Continue as directed.